Veneers at Best Dental with Dr. Jasmine Naderi. Best Dental offers a variety of cosmetic dentistry options to enhance the beauty and function of your smile line. For those wanting to transform the beauty of their smile to the next level, porcelain veneers may be a great option. Veneers are thin shells of porcelain that are bonded to your teeth to correct any major or minor imperfections that your smile may have. Porcelain veneers are stain-resistant, so your smile will remain enhanced and beautiful for many years. If you always wanted to show off a better-looking smile, dental veneers may be a great option for you. Dr. Jasmine Naderi may recommend dental veneers if you would like to improve the appearance of smile-line. Veneers can also be recommended for close spaces, whiten discolored teeth, correct slightly crowded teeth, and to restored teeth that are broken and worn down. Dental veneers are thin materials that are placed on the surface of teeth to enhance the appearance of a person’s smile. What is a Dental Veneer made of? Dental Veneers are made of either Porcelain, or a Resin Composite. What are dental veneers routinely used for? Dental veneers normally treat discolored teeth, teeth that are wearing or breaking down, teeth that are misaligned, and teeth that have large spaces and gaps between them. What is the procedures involved in getting dental veneers? Treatment planning with Dr. Jasmine Naderi will be of utmost importance and telling her exactly what result it is that you are looking for. This step is the foundation and is the cornerstone to the beautiful smile that you’ve always wanted. X-rays and initial impressions will be taken during this appointment. Preparation appointment: This appointment will involve the use of a local anesthetic (usually Lidocaine) to numb the teeth that are to be prepared. Anywhere from 1/4-1/2 of a mm will be reduced from the teeth that are to be restored with veneers using a dental hand piece. A final impression is taken and sent off to our laboratory for processing and you will leave home with interim or temporary veneers for a period of two weeks. Bonding appointment: When you dental veneers are returned from the lab to our clinic we will schedule and appointment with you. During this appointment, the interim veneers are removed, your teeth are cleaned thoroughly, and the permanent veneers are placed with a temporary material so you may take a look at the final restoration before it is permanently cemented on. At this time, you may ask Dr. Jasmine any questions, and if you want anything modified. If you are happy with how everything looks, Dr. Jasmine Naderi will bond and cement the teeth permanently into place with a special dental cement using specifically for veneers. 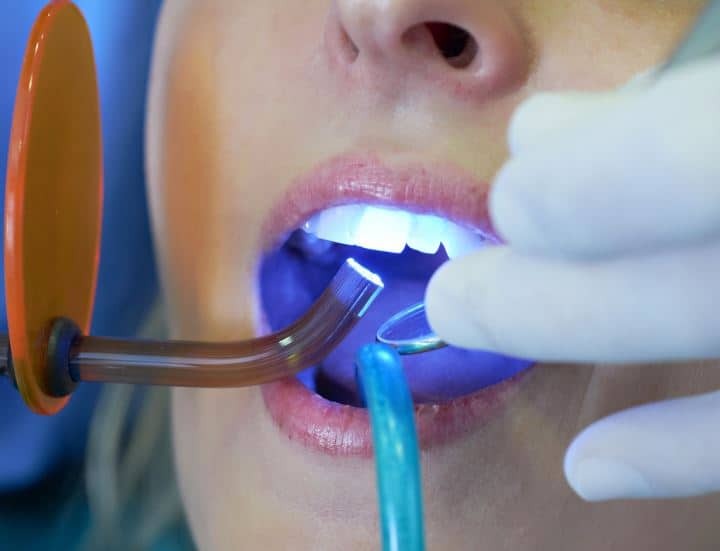 The veneers are light cured into place using a specialized blue light, and the extra cement is cleaned off using dental instruments. What are some advantages of Dental Veneers? The provide a beautiful natural appearance that will improve your confidence. Porcelain veneers do not stain. 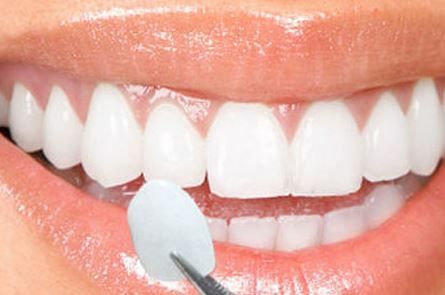 Veneers require minimal tooth shape preparation to give you a more beautiful smile. Larger cavities and worn down teeth may require additional treatment to cosmetically fix you smile such as dental crowns and even root canal therapy if a large cavity is detected. At Best Dental, not only is cosmetics our goal, but we want to make sure that your overall oral health (teeth and gums) is of utmost importance. 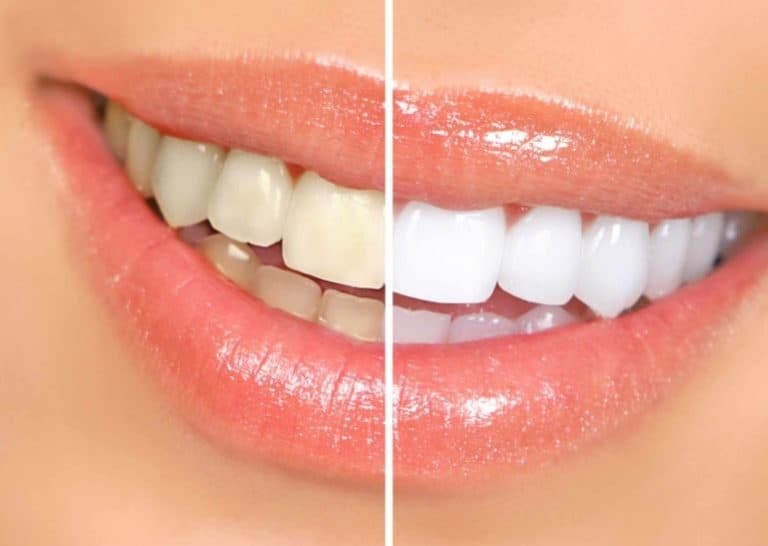 In addition to traditional cosmetic dentistry, a teeth whitening session can be suggested to brighten your smile prior to cosmetically transforming your smile. We offer both take home trays and in-office whitening to enhance the results that you will get with your cosmetic makeover. Teeth whitening at Best Dental with Dr. Jasmine Naderi. If you are in need of replacement options, especially in the front areas of your mouth, dental implants may be recommended for a transforming cosmetic option. These are titanium cylinders that hold dental crowns in place to give you that beautiful smile that you have been longing for. Some of our patients are genetically susceptible to grinding and bruxing their teeth. Over time, these grinding habits can really wear down their teeth. Some of these teeth may end up being sensitive to the point where root canals may be necessary. Here at Best Dental, Dr. Jasmine has been trained to help people with broken down and worn-down teeth restore the beauty and function of their smile. If you need a full mouth rehabilitation, Best Dental is the place for you. This question will really depend on your insurance plan, and if the teeth that we are cosmetically fixing have actual wear or cavities on them. If your teeth are healthy and you are looking to cosmetically enhance your smile, dental veneers and lumineers are generally not covered by dental insurance. If your teeth are breaking down due to wear and active cavities, then a lot of times dental insurance plans will help you cover a portion of the costs. Dr. Jasmine Naderi is a leading cosmetic dentist Richmond, TX who also servers the Katy, Pecan Grove, Sugar Land, West Chase, and surrounding areas. If you need any kind of cosmetic dentistry, whether it’s for worn down teeth or to just enhance your smile, Best Dental is the office for you. Get the dental care that you and your family deserve. We invite you to call or visit our state of the art office today to learn more about custom dental veneers and how it can enhance the beauty of your smile. Contact our office today for more information about how cosmetic dentistry can be right for you.